Having acne whether severe or mild is certainly frustrating to deal with, but luckily there are many trusted skin specialist out there who specialize in treating this skin condition. Reflections Laser & Wellness Center is proud to announce that we are certified in skincare, in fact, we have our very own Medical Aesthetician and Clinical Medical Esthetician in-house who specializes in Acne Treatments. Janet Robbins is a certified skincare instructor for GlymedPlus Skin Science Institute, with over 20 years of experience in the aesthetic industry graduating from the Florida College of Natural Health in 1993. Janet has enjoyed creating “Positive Skin Karma” for her patients in her Boca Raton & Juno Beach Locations. 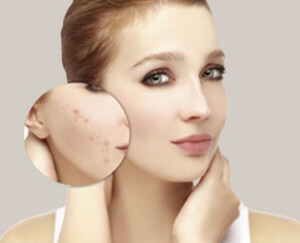 Our Acne treatments are customized to treat all grades of acne treating teens through adults. We incorporated Gylmed medical grade products such as salicylic acid, benzoyl peroxide, chemical peels, deep pore cleansing, medical acne extractions if needed and wonderful customized facials. We even treat Acne Scarring! Why would you come to a Medical Aesthetician / Clinical Medical Esthetician verses a Dermatologist? A traditional dermatologist has the ability to prescribe medications for treating not only acne but many other types of skin conditions. An esthetician cannot rely on a quick fix of prescription medication so we have no choice but to take an investigative approach for treating acne and other skin conditions. Being an esthetician with over 20 years of hands-on experience working with patients, we search for healthy natural alternatives for blemishes that our clients have had tremendous success. WHAT DO I NEED TO DO TO GET STARTED WITH ACNE TREATMENTS? In order to begin acne treatments, it is necessary to schedule your initial SkinCare Analysis to evaluate your skin and discuss the best course of action. If you would like a SkinCare Analysis please call our office to make an appointment with one of our licensed SkinCare Specialist. For more information about Acne Treatments or any other cosmetic treatment options, don’t hesitate to call us to schedule an appointment.